House of Hound, an exciting retailer of dog only products situated in Roseburn, Murrayfield Edinburgh. Our aim is to bring quality service, produce and products to the canine market, necessary to both the care and pampering of our best friends, with a focus on brands new and exclusive. Practical, stylish and on occasion luxurious, an accessible boutique environment where our customers can shop, dwell and return to. A local hub for the many dog owners in the area and beyond. Dogs are welcome in the seating area of the shop. Griffen Fitness was established in 2005 and offers Personal Training to individuals and small groups. We welcome your furry friend into PT sessions, as getting fit should easily fit into your lifestyle to be highly effective… with results guaranteed! Hamilton & Inches is Scotland’s luxury jewellery house, with an iconic showroom in the heart of Edinburgh. We welcome all members of your family, including treasured pets. We are a independent family owned health food business that loves dogs! We have an excellent range of herbal remedies and supplements for you and your pooch. 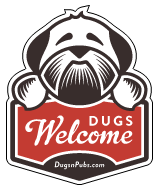 There are a total of 120 dog friendly listings in the Edinburgh Shops category. Please log in, or sign up as a member to view all listings.